The Gear-O-Gram magazine of BorgWarner Corporation (Muncie) is now available in the DMR. The digital collection includes 167 issues of the magazine published by and for employees of the BorgWarner Corporation located in Muncie, Indiana. 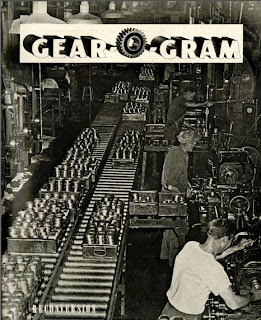 Published from 1944 to 1972, the magazines include details of employee activities, announcements of service awards and accolades, and general interest pieces about automobile transmissions. Pictured right is an issue from July of 1945. The BorgWarner Corporation had a long history in Muncie, beginning in 1928, when the auto part manufacturing company merged with three Midwestern auto part makers, one being Warner Gear of Muncie, Indiana. The company expanded quickly and experiencing annual sales of $50 million in 1929 to over $600 million by the late 1950s when Borg-Warner became a leading manufacturer of automatic transmissions. BorgWarner's Muncie manufacturing plant closed its doors in 2009. 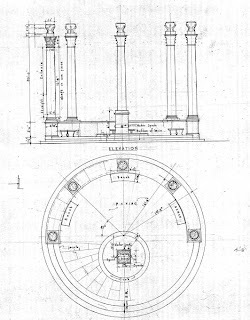 The Ball State University Building Plans digital collection is a representative sampling of architectural plans and blueprints for Ball State campus buildings dating back to the construction of the Administration Building in 1899. The plans were digitized from the original drawings held by Facilities Planning and Management. Recently, metadata from the collection was enhanced to provide better access to subjects and architects as well as further describe the content of the images. Use the Advanced Search feature and show terms in the Subject - LCSH field to get a full list of the buildings and landmarks that are covered, such as Beneficence, seen here.